Yeah the AFC will now require physical mediums to give demonstrations in the light or to be monitored using infrared light and/or image intensification devices. I think image intensification needs only the equivalent of starlight as the source and I've always thought such a tiny amount of light, under careful control, might not put a medium at risk. Has that ever been tried or put to spirit helpers? mac wrote: Yeah the AFC will now require physical mediums to give demonstrations in the light or to be monitored using infrared light and/or image intensification devices. I think image intensification needs only the equivalent of starlight as the source and I've always thought such a tiny amount of light, under careful control, might not put a medium at risk. Has that ever been tried or put to spirit helpers? I think quite few did it in at least dim red light. I have posted a response regarding the Psychic news article on another thread where Jane also posted a link, however, since she has also started this thread on the same topic I will re-post my comments here. The document titled “Protocol for Physical Séances at the Arthur Findlay College and Arthur Findlay Centre,” lists eight protocols that from January 1, 2015 apply to physical mediumship demonstrations at the above mentioned centres. 1. In principle there should be no séances held in total darkness. Subdued lighting including coloured lights or Natural light is preferable at all times. a) They must be filmed with infrared cameras. It would be invaluable if the AFC invested in a video system that uses multiple cameras that could be linked not only to a recording device but also to a monitor outside the séance room. b) Night vision viewers are made available to watch events live during the séance and so have independent witnesses acting on behalf of those present. With these conditions in use there would be no need to secure a medium to the chair with cable ties. Cabinets are of course permitted to be used, but should be searched by independent sitters prior to séance commencing. Trumpets and planchettes may also be used if requested by the spirit operatives. Sometimes percussion instruments may be utilised in the séance and small lightweight balls; all requests for equipment by the spirit operatives should be considered if sensible and appropriate. 2. All physical mediums should be assessed under test conditions before being allowed to work at AFC and a register of approved Physical mediums is kept just as for all college tutors. 3. Rooms where physical séances are to be held should be prepared correctly. It is essential that the room has a good clean if ectoplasm is being produced. All clutter to be removed and as much metal as possible as this depletes the energies being used. It is known that soft furnishing used to disintegrate over time in rooms used for physical séances, thus showing that everything in the room affects the conditions. 4. Sound is always important in a physical séance. Silence does not provide the right energy for physical mediumship. It is important to have vocal responses from the sitters about what they are experiencing or what they are not experiencing, so that these can be compared. We must remember that physical mediumship is witnessed by all present through the physical senses, therefore all should be perceiving the same thing at the same time. Music can be a great help in building the energy, but should not be so loud that it is distressing to the sitters and is not required to be played throughout the séance. 5. No sitters may bring into the room any type of telephone, camera or recording device. 6. Entry and exit to and from the room should be monitored at all times as someone entering or leaving without permission can have detrimental effects on the medium. 7. Finally, it must be remembered that a physical séance is not an entertainment or a fun show, but provides the opportunity for the intelligent minds of those in the spirit world to provide evidence of their survival in some quite amazing ways. 8. The medium or chairperson at a séance must give a pre-séance briefing to the sitters with details of what can and can’t be done during the séance, tailored to the individual medium who is working during the séance. It is, of course, the first protocol, including its two subsections that the editor and Scott Milligan appear to see as of concern and it is that protocol that has given rise to the emotive headline of the article. The article includes significant coverage of the views of Scott Milligan, who with the introduction of these rules for the demonstration of physical mediumship, has withdrawn from all his bookings at the College. At a meeting with Bruton and other officials of the AFC and SNU, Milligan was shown the protocols, and advised that it was not a reflection on his mediumship, “but a way forward for the College.” Milligan, however, took the view, based on “past investigation,” that he “could not fulfil the filming or night vision goggle requirements,” due he claims, “to the vibration that is emitted in infrared.” Nor was he willing to accept the opportunity offered to him by the College to test the use of any infrared camera in his home circle. According to Milligan, when he “sat for the spirit world, guidance was given that it would be unwise at this moment” of his “unfoldment to interfere by bringing modern technology into the sanctuary” of his home circle. In addition Milligan was concerned as to whether any “safeguards were to be put in place” to protect him if the camera were to “damage” his mediumship or his health when used in a séance. Now, it is known that in the past both I and Jim, the other administrator of this forum have given considerable support to the fight to save Psychic News when it was in danger of being lost to the world forever. On this occasion, however, I feel compelled to take a different position, and give my support to the decision made by the AFC and the protocols that they have put in place. I fully endorse the need, as outlined by David Bruton, for the investigation of Spiritualism, and in particular physical mediumship, to be placed on a scientific footing. To once again work collaboratively with scientists and academics under controlled conditions is long overdue, and that the AFC and the SNU are actively pursuing that approach can only be commended. I am, as members of this forum no doubt are already aware, totally opposed to ‘Dark Séances,’ that is, séances held in total darkness; I don’t consider, as the editor of PN argues, “that it would be ‘preferable’ to conduct séances in some degree of light,” I consider it imperative. Until there is once more light, albeit subdued lighting reintroduced into the physical séance room, physical mediumship and Spiritualism will continue to be plagued with accusations of fraudulent mediums, and sadly, all too often such accusations have been warranted. The history of physical mediumship, and in particular materialisation mediumship, is littered with fraud perpetrated in darkened séance rooms. And, in the total darkness that has been the trend in recent decades, there is no, and cannot be any, demonstration of what the editor describes as physical mediumship’s “most developed form,” – the “visible and audible manifestation” of the materialised spirit of a person who has previously passed from physical life into the realms of spirit. While indeed, the physical materialisation of a spirit is undoubtedly the “highest level” of physical mediumship, until this once again occurs in the séance room where there is light, no one can or will be able to “see, touch and speak with a loved one” that has physically manifested, and so prove that they have survived physical death. I would also dispute Sue Farrow’s claim: “Traditionally, and with no confirmed exceptions in the Western world, this rare form of mediumship has undergone much of its development in the dark.” Perhaps more time spent in researching the records of Spiritualism and the development of physical mediumship and especially materialisation mediumship would be of benefit. In doing so it would become very clear, and quite quickly, that while what Spiritualists considered the “physical phenomena” of mediumship, that is, the movement of objects within the séance room, the ringing of bells, the winding up of the musical-box, the activity of the “speaking tube,” and the touching of sitters by unseen hands, etc., took place in the “Dark Séance,” with the medium remaining in the room restrained by the sitters, for the phenomena of “form-manifestation”- the materialisation of spirits, - Spiritualists held what they called the “Light Séance,” – with the medium seated inside the cabinet, more often than not restrained in a chair, and with the light in the séance room though subdued still bright enough for the sitters to be able to see each other, the room and, of course, to see the materialised spirit-forms that would emerge from within the cabinet or materialise and dematerialise outside the cabinet curtains. I could give you hundreds of examples of the records that show, beyond a shadow of a doubt, that materialisation séances were not held in the total darkness. Spiritualists very early on recognised that to have such apparent phenomena in total darkness was a waste of time, and hardly gave credibility to the phenomena they proclaimed proved survival over death. Spiritualists in the past wanted light in their séance rooms, and they wanted sceptics and other non-believers to see what was occurring in the séance room so that they too would be convinced of the reality of spirit. Not only light, but even going so far as to introduce photography, complete with its flash of blinding light, into the séance room in order to try and capture an image of the spirits that were materialising. Again, there are many examples of this, and dare I say it, none of the mediums suffered the least harm to themselves or their mediumship in the process. In the 1900s photography was still in its infancy, and the methods used were crude in contrast to what is possible today. We now have modern technology that could be used without any of the potential discomfort or distress occasioned in the past by the sudden flashes of light, and that technology is infrared photography, and thermography. I do not believe, based on the scientific evidence available, that any genuine physical medium has anything whatsoever to fear from appropriate use of infrared photography or thermography. Are we, therefore, going to fall into the trap of saying that whilst the AFC spirit guidance may have been flawed in some way, the spirit guidance of physical mediums will not be. Should we be accepting that the “guidance” received by a physical medium will always be 100 per cent correct and unadulterated by the personal opinions of the medium, but spirit guidance through all other forms of mediumship will be? To me, that is a very dangerous view to take. I am sure that Scott Milligan is sincere in his belief that it is his spirit guidance that has advised against the use of modern technology, and that the decision he has made to withdraw when confronted with the AFCs new protocols was not an easy one, and no doubt he feels disappointed in the approach the College has decided upon. But how certain can he be that the guidance he received is 100 per cent accurate and uninfluenced by his own perceptions, when he, like so many other physical mediums of today talk repeatedly about the “sensitivity of ectoplasm,” and the potential “dangers” of light. It is a liturgy used over and over again in public séances to convey to the sitters the risks that the medium is taking by sitting; it is a liturgy that ensures that no one can see what is happening in the séance room; it is a liturgy that is based on a theory about how physical phenomena and materialisation occurs. It is a theory introduced into the ‘folklore’ of physical mediumship long after materialisation phenomena first occurred. And, it is too readily used by physical mediums of today as a way to justify their refusal to work in the light as the pioneers of physical mediumship did in the past. While undoubtedly there is a need for care in the experimentation with new technology, I am of the view that there is far too much unnecessary, and unjustified fear about the risks involved. This is especially the case when we look at infrared or thermography. These modern technologies simply do not emit any “vibration,” that could cause harm to the medium. I agree with David Bruton when he stated that Scott Milligan’s withdrawal from involvement with the AFC is “a lost opportunity which could only further the cause of physical mediumship." Scott was being offered the opportunity of a lifetime; the chance to be the first physical medium to prove beyond all reasonable doubt his mediumship was genuine, and in doing so prove to the whole world that what Spiritualism propounds is true! The physical and materialisation mediums of the past would not have hesitated; they would not have turned their back on the possibility of bringing the truth of Spiritualism to the world. Over and over again, those mediums placed their trust in spirit and agreed to undergo any restraints, any tests and any experiments that might help to prove the reality of Spirit. They did so when they had no way of knowing whether such experiments would work, or be dangerous to their mediumship or health. And they did it gladly. As for the question posed by the Psychic news article – does the introduction of these protocols herald “the death of physical mediumship as we know it?” In one respect, perhaps it does, and perhaps that really is a very good thing. For when we bring physical mediumship “back into the light” we just might begin to eliminate the fraud, and highlight the genuine, and in so doing really confirm the message of Spiritualism. Of course, in another respect, sadly the AFC protocols are unlikely to have any significant impact on the physical phenomena scene beyond the walls of the Arthur Findlay College and its outreach centre in Stafford. Given the majority of current physical mediums operate largely or exclusively outside of the authority or control of the AFC or the SNU, in reality the ‘dark séance’ approach is likely to continue unabated, and while those mediums may talk again and again that at some future but unspecified time they plan to introduce light into their séance performances, the chances are that will never happen. It won’t happen because they will continue to say that to do so is too dangerous and their spirit guidance forbids it. And, in the position they take they will, no doubt inadvertently, allow the fraudulent to continue to operate, and ultimately, even if they are genuine, will fail to achieve what they claim they aim to. They will never prove in the darkness that Spirit Return is for real. That as the AFC suggest not have mediums strapped to me it speaks of their ignorance of physical mediumship why you strap a physical medium! This is done so the body will not respond to the external spitits signals through the subconscious (which controls the medium automation in the body) A medium in a trance has its own consciousness gone and commissioned an external spirit governing body - which then can mean the body responds to the spirit To physically. the medium is not then strapped the spirit can take the medium in possession and move the medium's body - which is easier to produce then making ectoplassma. - Result is the same - but two different ways- Yes, so very stupid not keep mediums strapped! I dont agre whit you Lis - that light is not dangerus for medium - I have seen the medium get internal bleeding and bruising after the light entered or bad behavior of participants. - Wisely is a risk. but that was white light. red ore infrared shuld be fine for a publicly demonstrating physical medium no physical mediumship should demonstrate in public if they do not pass the red light - only exception is independent direct vote, I believe. I have long thought that an image intensifier device linked to a remote monitor and video camera might be an acceptable alternative to dim, conventional red or infrared given the tiny amount of light needed but what do I know? It seems to be the norm that all such suggestions are immediately vetoed by practitioners. excellent presentation, Lis! Your most pertinent point, though, is that events in the big, bad world away from the AFC will not be impacted by any protocols adopted there. They are wholly irrelevant to those who neither know about them nor would care if they did. Would that Scott Milligan (and other mediums) could join us here in this discussion and also those who have experienced physical mediumship at AFC and/or who still pursue experiencing physical phenomena. An equally good place to discuss the subject would be on the discussion forum area of the Psychic News website but that's now become off-limits to non-subscribers and even when it wasn't it was little used. What a sad state of affairs that PN carries the details of the AFC edict but that subscribers to the periodical - once seen as the voice of Spiritualism - have no interest in making their views known on this important issue. A reflection, perhaps, of the lack of interest and understanding of Modern Spiritualism and how it is linked to the once-important Psychic News newspaper. Sadly I think you are right in saying that for most PMs the AFC and the SNU protocols will be irrelevant and are not likely to impact on what goes on with the various current PMs that harvest their clientele through other channels. Nevertheless I am glad to see that the peak Spiritualist body and its college have taken a stand and hopefully it will serve as a warning to Spiritualist churches and centres that dark séances are not the way to go. Equally, it is a pity that such mediums are so unwilling to discuss the issues in a forum such as this. I would also add my disappointment that the PN forum is so under utilised and not available to non-subscribers. The subject and the issues raised by the PN article are vitally important to Spiritualism, though admittedly not to those who while passionate about physical mediumship are not actually interested in the Spiritualist movement. If it were me then I'd need to know all about Spiritualism's history but I don't expect others to have a similar level of interest. We shouldn't forget that mediums were around long before Modern Spiritualism even had a name let alone a history! And we should also not forget that you don't need to be a Spiritualist or to have any knowledge of Modern Spiritualism to be a medium. But in this Spiritualist's book you DO need to act as a go-between for communication between this and the etheric world. I don't subscribe to the modern approach that psychic sensitivity and medium mean the same thing! On just one of your points, the PN discussion forums used to be open to non-subscribers (like myself) but must have been closed in the last month or so. But even before then there were probably just three of us contributing in any semi-regular fashion - three out of all the PN readers and one of 'em not even a reader any longer! I've never been able to figure what that tells us... But PN now is for 'mind, body and spirit' and Spiritualism doesn't seem to figure that much and presumably physical mediumship isn't high on its list of reader interest. Continuing in that same vein I have always suggested that seekers should read all they can and PN and Two Worlds used to be two of my suggested publications but now I wouldn't include PN. Barbanell would roll in his grave. I suppose that few things stay the same and it's many decades since Spiritualism and PN were at the peak of their popularity. I wonder, though, whether it would have been better for both just to have faded away completely rather than having the enfeebled versions of both as now. Lis has, quite rightly, drawn peoples attention to the historical aspect of materialisation and the recurrence of fraud. From the inaugural issue of The Liberator, Julia Schlesigner editor, and Bishop S. Garrison, publisher. There's a paucity of editorial cartoonage in Spiritualist papers; this one (courtesy of John Buescher) shows us what could have been, but wasn't (unfortunately). 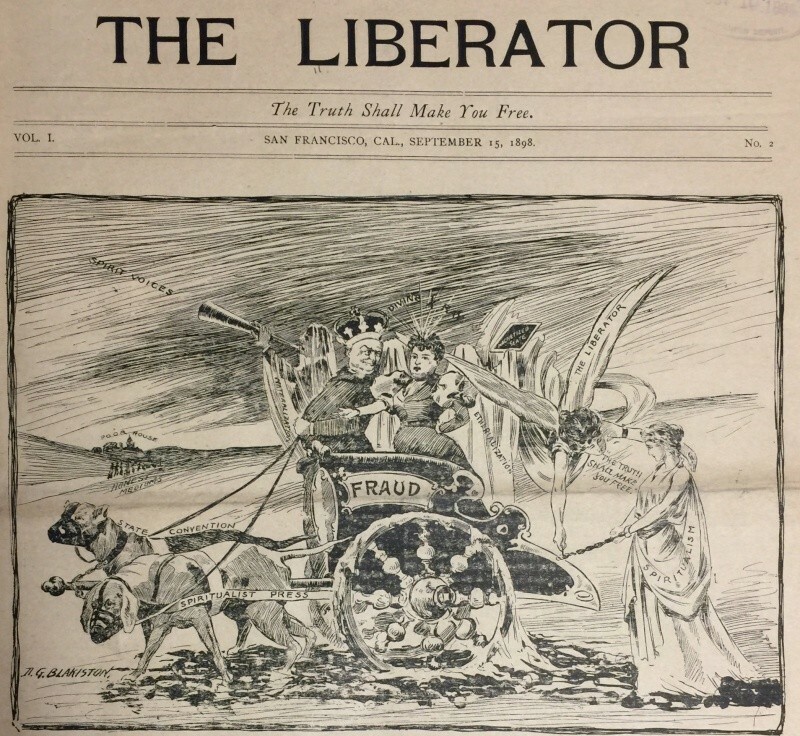 The man and woman driving the chariot of fraud are, we can guess from reading Julia Schlesinger's "confession" about the fraudulent medium ring operating in the Bay Area in the 1890s, likely to be among the leadership of the Progressive Spiritualists in San Francisco -- possibly Edward K. Earle (a popular slate-writing medium, and a particular target of Schlesinger and Garrison) and Mrs. J. J. Whitney (easily the most recognized medium of the 1890s, due to her knack for self-promotion and her work as the medium for Jane Lathrop and Leland Stanford's exploration of Spiritualism). But that's speculation on my part. There's much to say about the cartoon -- the obviously faux materialized spirit, the muzzling of both the Spiritualist press and the California State Convention of Spiritualism, which are yoked to the chariot of Fraud, the "divine X ray" (whatever that might be, knowing that X rays were only discovered in 1895), the role that the editorial staff of The Liberator carves out for itself, breaking the phenomena-forged manacles of Spiritualism itself -- but what I find really interesting about the cartoon is that which it is difficult for us to see: the long-ish line of honest mediums, headed for the poor house. At root, apparently, fraud was a marketplace issue -- a problem of unfair competition. Honest mediums are apparently unable to compete effectively, for the money of seance-sitters, against well-organized fraudulent mediums who had co-opted the press and the state convention, and who offered spectacular materialization, spirit voices, etherealization, magnetized slates and the Divine X Ray to (one presumes) a large market of eager consumers. I wonder whether that admission -- that real mediumship lacked competitive force -- was intentional, but it is in any case liberating. The cartoonist here, for the record, is Duncan G. Blakiston (1869-1931), the English artist, who lived in San Francisco from the early 1890s onward with his wife Edith and son Charles. How Duncan the younger (I think his father was D. G. Blakiston, R. A.) ended up cartooning for Julia Schlesinger and Bishop S. Garrison is something I wish I had the time to figure out. The issues surrounding physical mediumship and its affinity with fraud (defined, narrowly, as ersatz effects produced by a medium or confederates, and detected as such, during a seance, by sitters themselves) are not merely matters of (quaint, or weird) historical interest. They are a real issue in the movement today, of which physical mediumship remains a vibrant part. Ectoplasm, levitation, and form manifestations are not merely historical artifacts; they are part of the belief system of a good many people, today. The SNU has just produced a new set of guidelines for physical seances conducted under its purview, and Psychic News has some things to say about those guidelines, which are also producing lots of discussion among believers and practitioners. These guidelines may be, as the PN piece hints at the end, a bit of knife-wielding targeted at a particular medium, but -- a propos of the attempt to get dark, public materialization seances under some kind of control in the early 1880s-- I am reminded that the first time, it's tragedy, and the second time it's something else entirely. I often explain my love of history is based upon the fact that if we remember our history we should be able to prevent repeatable mistakes. Sadly we seem totally unable to do so in the face of Physical Mediumship. 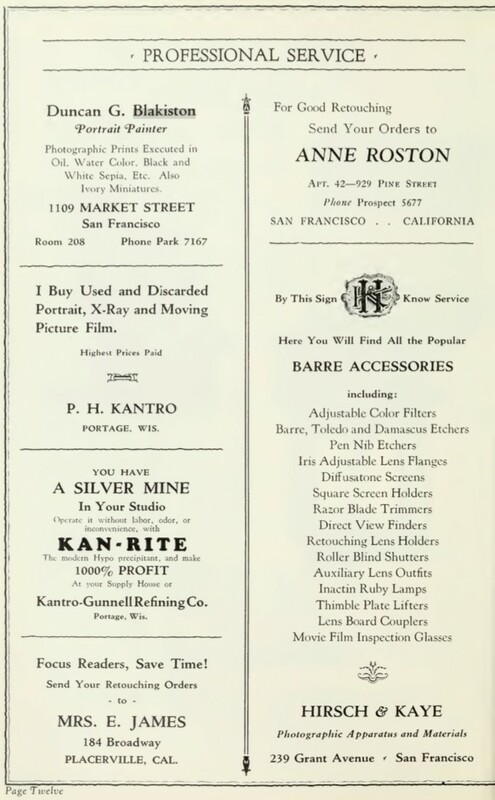 The events in San Francisco mirror the problems with the Boston Mediums in the 1870's and reflect the issues that led all major mediums, together with the editors of Light and the Psychological Review ( https://www.spiritualismlink.com/t2043-light-magazine-and-psycholgical-review-against-dark-seances ) creating a petition signed by almost all the influential Spiritualists of the Day to ban dark séances. Rev Stainton Moses, DD Home & Emma Hardinge Britten wrote extensively against them and notables like William Eglinton, JJ Morse, Catherine Woods etc. etc. all joined in. However, despite this terrible track record the AFC has recently allowed Physical Mediumship in the dark, indeed they allowed Kai Muegge to work there despite the clear issues surrounding him. Even worse the National Spiritualist Association of Churches allowed one of the most suspect of the group Warren Caylor to perform dark séances at their highlight annual Lily Dale Camp season. The risk of embarrassment to the AFC and the SNU should be obvious to all. There can be no wonder why, given all of the current challenges to many of the modern group of mediums, that they would move to reinstate their standards, I hope that the NSAC also return to this type of protocol before inviting any physical mediums to their flagship events. It appears to me, from reading David Bruton and the SNU's responses that they were bending over backwards to try to open the door for Scott Milligan and I can only wonder why he chose not to work with them. Like Lis I find myself at odds with Psychic News over this (now just because of the efforts we put in to ensure its survival we would expect differences of opinion especially as Sue Farrow is an avid supporter of Physical Mediumship), I am rather disappointed that this approach, essentially a defence of Scott Milligan who the AFC and David Bruton were clearly not accusing, was made rather than a challenge to the community of Physical mediums to clean their act up. I cannot understand why genuine mediums, given all the history we have outlined that materialisations did not start in the dark, that most early mediums were open to extreme tests including photography using magnesium flares and fraud has been present as a major thread through this type of mediumship, do not welcome these protocols as a way to start bringing their work into the light of science. Oh well I hope you enjoy this material and the links, do visit Marc's Chasing Down Emma blog it is well worth subscribing to he has been doing an invaluable job for Spiritualists. Quite definitely a case of 'plus ca change...' Great material and oh-so relevant over a century later. The advertised photographic services were that era's PhotoShop I guess! I rather like the muzzling of the dog named Spiritualist Newspapers. It's a wonderful cartoon, satire does not die it re materialises. One area I have difficulties with is metal, some of the early materialisations occurred with the mediums sealed in metal cages with metal bindings, even chained to the wall or sealed in a metal hoop around their waste which was embedded in the wall. None of these controls seemed to affect the quality of their work. I know of a book which is in preparation that should help lay to rest many preconceptions. The problem is that the history of physical mediumship is not researched in detail and people often rely upon the perceived history of more recent mediums or flawed books about the or about the past. If something as important as that can be misrepresented is it any surprise that the history of Physical Mediumship is so incorrect. One example is that Helen Duncan is rolled out as the example of someone injured by ectoplasmic Recoild. Point one when the cheesecloth Peggy waistcoat was grabbed in a séance in 1932 she was not hurt, indeed she was fined for fraud in court, its easy to see the pictures of Peggys waistcoat, albeit she maintained her SNU mediumship accreditation. Point two when she was arrested in 1944 mid séance she was not hurt, now clearly it was her mediumship ability that brought her to be arrested but there is no record of ectoplasmic injury. Yes she appeared to suffer harm but by 1956 her accreditation as a medium with the SNU had been withdrawn, she was morbidly obese and seriously ill with diabetes. She did not die immediately either but some months later, with luck we will soon be able to find the cause of death from her death certificate, I suspect it will be more related to obesity and diabetes than an implied ectoplasm recoil, albeit I can here the cries of the committed to it being a cover up. I am not doubting her actual ability as a medium just raising the valid issues that surround the myth we have created. Barbanell refers to such injuries in his book about her. Do you mean no medical records of such injuries?